- from Charles M., CDx3 Notification Service subscriber, February 10, 2015. See more preferred stock investor reviews here. Over the last few years we have seen an increase in the number of new preferred stocks that are unrated by either Moody’s Investors Service or S&P. There are a number of reasons that a company will choose not to have its preferred stocks rated that have nothing to do with the company’s wellbeing. But the uptick in the number of interesting, but unrated, preferred stocks has left many preferred stock investors wondering how to best go about evaluating the creditworthiness of the issuing company on their own. And that’s really the key here – everyone’s risk tolerance is going to be different and, in the end, you are the one taking the risk so it is your comfort level that this exercise must satisfy. Consequently, it is important to remember that what I present here are just ideas – a sample of the types of things that preferred stock investors might consider while evaluating the creditworthiness of a preferred stock issuer. This is not an exhaustive list by any means, but should give you something to augment your own method or provide a way to approach your due diligence. Preferred stock investors (income investors) should not feel discouraged when you find an interesting security that turns out to be unrated; after all, those who invest in common stock (value investors) are used to the idea of evaluating the issuing company on their own since common stock shares are entirely unrated (although there is no shortage of pundits and media types offering buy/hold/sell recommendations, even in the absence of knowing the investor’s risk tolerance, resources or goals). However, while there is some overlap, the question that you, as an income investor, are trying to answer when performing a company evaluation is different from that being sought by value investors. As an income investor, your primary concern is the ability of the issuing company to pay future dividends to you. Preferred stock dividend amounts and the dates that those payments must be made are known in advance for years to come, so the ability to pay is mostly a matter of how the company manages its cash flow. Creditworthiness is therefore the main consideration for income investors. A value investor’s fortunes, on the other hand, are determined by how much the company’s common stock shares increase in value over time. Any growth in common share value is primarily driven by the company’s profitability and its ability to successfully re-invest those profits, increasing the company’s value (as measured by the common stock price). Profitability, more so than creditworthiness, is therefore at the top of the list of considerations for value investors. Even if you are not an expert in, or very familiar with, a certain industry, you can still perform a meaningful evaluation by comparing your unrated target company’s key metrics with those of a rated company from the same industry. While your target company’s preferred stocks may be unrated, this “Best-In-Show” approach allows you to determine what the rating would probably be. For example, let’s say that you are interested in the new series A cumulative preferred stock offered by industrial REIT CorInfrastructure (CORR) at 7.375 percent. This traditional preferred stock trades on the NYSE under the symbol CORR-A. 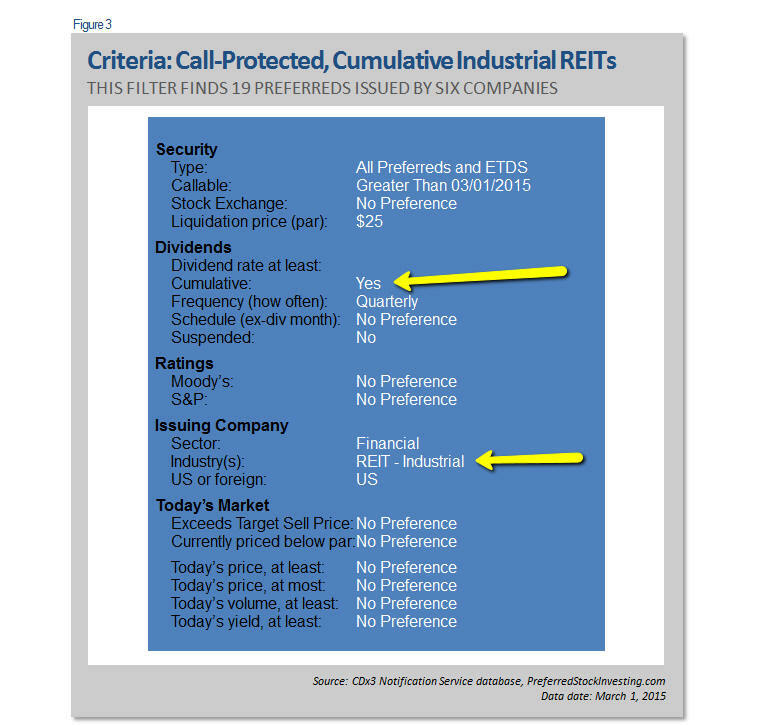 In addition to CORR-A, the criteria shown in Figure 3 give me 18 cumulative, call-protected preferred stocks offered by five other industrial REITs – CubeSmart (CUBE), Monmouth (MNR), Public Storage (PSA), Stag Industrial (STAG), and Terreno Realty (TRNO). Preferreds from CubeSmart and Public Storage offer Moody’s ratings of Baa3 and A3, respectively. 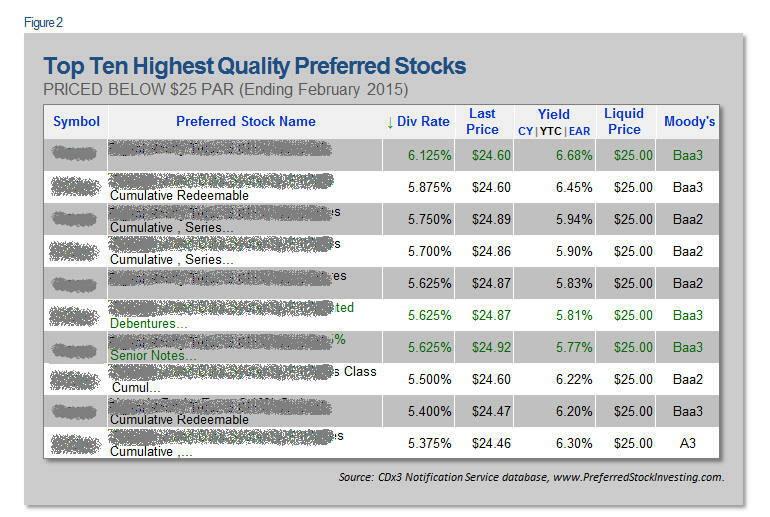 Preferreds offered by the other industrial REITs, including CORR-A, are unrated by either Moody’s or S&P. By comparing CORR’s key metrics to those of CubeSmart (at the low end) and Public Storage (at the high end), you can start to get a sense for how your target company would stack up if it were to have its preferred stocks rated. CubeSmart’s Baa3 rating is at the bottom of Moody’s investment grade scale, so if your comparison leaves you feeling that CORR is probably a weaker choice than CubeSmart, you know that you are probably considering a preferred stock that would be rated as speculative grade. Using the Best-In-Show approach allows you to get a sense of how your target company’s preferreds would probably be rated. By starting with this type of comparison, the rest of your evaluation becomes much easier to do since you are now looking for information that will confirm, or not, the results of your Best-In-Show comparison. Put another away, you no longer have to figure out if your target company’s key metrics are good or bad; you just need to see if they are better or worse than your Best-In-Show company. Remember that the question preferred stock investors are trying to answer is: What is the likelihood that the target company will be able to meet its future dividend obligations (its creditworthiness)? What are the key metrics that answer that question and where do you find them? Those who do these types of evaluations for a living will tell you that the real answer to that question is that it takes several years and lots of very fancy computer software (and even then, they don’t always get it right as we saw a few years ago). And that is probably the right answer. Unfortunately, the more shortcuts you take here the more risk you are assuming, but the fact is that very few preferred stock investors are going to spend more than a few hours, if that, trying to determine the creditworthiness of their target company. To further complicate the task, what may be an important “key metric” to you may be entirely unimportant to someone else. So there is no such thing as a single set of key metrics that is usable by every investor; over time, you will need to adjust the metrics that you use to meet your own needs. But once you develop a list of key metrics that are most meaningful to you, start with the heavy hitting show-stoppers first. This will save you tons of time. There is no need to analyze more than a few key metrics if you consider the few that you are using to be show-stoppers. You do not want to spend hours evaluating all sorts of metrics only to find that the target company cannot meet one of your show-stoppers; do the show-stoppers first. If your target company does not have enough cash to meet its current debt payments, for example, is there really a need to continue your evaluation? Key metrics come in two flavors - standard metrics and industry-specific metrics. Free Cash Flow: How much cash does the company keep after meeting its obligations, including existing debt payments and preferred stock dividends? See the Statement of Cash Flows. Operating Cash Flow: Similar to Free Cash Flow, Operating Cash Flow tells you if the company’s operations (cash received from customers less cash paid out to suppliers) generate a net positive amount of cash. See the Statement of Cash Flows. Quick Ratio: Similar to Current Ratio (below) but only counts cash and assets that can be quickly converted to cash (such as the company’s accounts receivable). See the Balance Sheet. Net Income: Is the company profitable? Net income is not applicable to property REITs (see Funds From Operations below). See the Income Statement. Current Ratio: Is the value of the company’s assets greater than the value of its liabilities? This standard metric is one of many that speaks to the company’s overall health. If the company would be unable to sell its assets in order to meet its liabilities, the company is over-leveraged. If that’s the case, they are probably unable to secure loans (still want to buy their preferred stock?). See the Balance Sheet. The Statement of Cash Flows, Balance Sheet and Income Statement can be found on the company’s website along with other SEC filings that are required for publicly traded companies. Also, Payout Ratio (the percentage of earnings paid out to shareholders as common stock dividends) has some appeal. Since preferred stock dividends are always paid before common stock dividends, the company’s ability to pay its common stock dividends can serve as an “earlier warning system” to preferred stock investors. But note that Payout Ratio is not meaningful for REITs since their Payout Ratio is set by law (REITs must pay at least 90 percent of their taxable income to preferred and common stock shareholders). Industry-specific metrics are those that apply to companies from specific industries. Preferred stocks tend to be issued by companies from certain industries, so building your list of industry-specific metrics is not as onerous as it might sound. And if you focus on building a list of industry-specific metrics that you consider to be show-stoppers, you only need a few of these. Property REITs (pREITs): Funds from Operations (FFO - take net income and add gains/losses from selling properties and depreciation back in), occupancy rate (the properties owned by most investment grade REITs typically have an occupancy rate that is at least 90 percent). Mortgage REITs (mREITs): mREITs do not own property. mREITs make money by using low-cost funds to buy securities that pay a higher return, the spread being referred to as Net Interest Margin. Insurance companies: The success of these businesses revolves around their ability to statistically forecast the probability of a claim against a specifically configured policy. The “Combined Ratio” metric measures the difference between premium revenue collected and paid out. Commodity-dependent: The fortunes of several industries are closely linked to the market price of a specific commodity. Examples include silicon for solar panels and electronics, platinum for catalytic converters in cars and crude oil for upstream producers. This last group offers a wide variety of preferred stocks. The estimated value of their reserves allows the company to take on debt to fund their production operations. In the upstream oil business, those assets are revalued twice per year by creditors with the next revaluation coming up this April. For commodity-dependent industries, the commodity’s value drives the company’s ability to secure credit and continue operations. Compare your standard and industry-specific metrics to the same metrics from your Best-In-Show company. There are literally dozens of these types of financial metrics but these will get you started. You’ll have to determine the degree to which they are show-stoppers, considering your personal goals, resources and risk tolerance. But if the target company compares poorly with your Best-In-Show company on such metrics, your warning lights should start flashing. Most of these industry-specific metrics are presented in the company’s quarterly and annual reports available on their website. These metrics are commonly presented and discussed during the quarterly conference calls that company executives have with Wall Street analysts as well. In fact, one of the quickest ways to build a list of show-stopper industry-specific metrics that are meaningful to preferred stock investors is to read those transcripts. Seeking Alpha provides access to these transcripts (current and past) on each company’s detail page (you may need to register a free username on Seeking Alpha). Just type in the common stock symbol in the search field at the top of this website and click on the Transcripts tab (example: Public Storage). Financial metrics can be dramatically affected, one way of the other, by special one-time events (such as an acquisition, natural or manmade disaster or a change of ownership). Such events will be discussed during the quarterly conference calls and also explained in the footnotes that accompany the company’s financial statements. A weak key metric may be caused by a one-time event so be sure to watch for those. The company detail page at Seeking Alpha, Yahoo Finance and many others also provides recent news stories about the company that can be very helpful and will often describe disruptive events that can affect your metrics. Also, the prospectus of your target’s preferred stock will include a section on risks and other significant company initiatives that can have a direct bearing on their ability to pay future dividends, so be sure to read over those items as well. For example, the prospectus for CORR-A provides a table of contents on the second page. To see significant company initiatives, click on “Prospectus Supplement Summary” and read about the company on page S-1. Risks are described under Risk Factors on page S-10. While it will never be as good as genuine clairvoyance, identifying your Best-In-Show companies then using a few show-stopper key metrics for comparison, especially after you fine-tune them as you gain experience, will allow you to make a more informed judgment regarding the likelihood of your target company’s ability to pay your preferred stock dividends.